Food Acidulants market size was over USD 4.5 billion in 2018 and industry expects demand of above 5.5 million tons by 2025. Rising demand for acid regulators in beverages industry mainly in flavoured water, energy and sparkling drinks. Acidulants offers beverage manufacturers wide range of beneficial characteristics including palatability, sensory appeal and nutritive value which would enhance consumer captivity towards their product that should support product demand. Lactic acids are widely used in processed meat products owing to its key properties including shelf life extension, pathogenic bacteria control, enhancing & protecting meat flavour, improving water binding capacity and reducing sodium levels. Global processed meat market is expected to surpass USD 1.6 trillion by 2024. Growing consumer preference shift towards protein rich meat consumables along with rapid development of processed meat value chain will favour meat products demand, thus propelling industry growth. Acidulants are commonly used in bakery industry to enhance product lifespan and impart soft texture. Rising consumer inclination for fresh & quality bakery products have propelled utilisation of acidulants owing to functional benefits including leavening, enhancing flavour, heat resistance, low hygroscopicity, mold inhibition, dough conditioning and dairy compatibility. Growing demand for on the go snacks due to rapid urbanisation and rising working population have propelled bakery industry growth which should stimulate acid regulator market growth. Stringent regulations regarding allowable levels of acid utilisation in food products by FDA and EFSA may lead to higher compliance cost which would limit industry profitability, thus affecting food acidulants industry price trends. Excessive usage of Acidulants may lead to taste and shelf life deterioration. Inorganic Acidulants manufacturing including phosphoric acid imparts toxic fumes which can harm facility personnel that causes irritation to skin, eyes and respiratory system. These restraints may hamper food acidulants market gains. Fumaric acid market size is projected witness gains may account for over 2.5% by 2025. Fumaric acid is majorly utilized as an acid regulator which results in lasting sourness and flavour impact. This acid is predominantly utilised in dry mix products to avoid moisture absorption and product degradation which may favour acidity regulators market size. Citric acid market size may surpass USD 2.5 billion at the end of 2025. It is majorly used acid regulator owing to high solubility, acidity and sour tasting nature its predominantly utilized as flavouring and preservative agent. Global carbonated beverages market is anticipated to surpass USD 400 billion by 2024. Dominant utilisation of Acidulants in carbonated beverages manufacturing as flavour enhancer owing to its persuading attributes including slightly tart, refreshing flavour and sweetness balance in sodas should foster acid regulator market growth. Food Acidulants from food & nutrition application may exceed USD 600 million by 2025. Wide application range in oats, soy, tomatoes, fatty fish, nuts, leafy greens and probiotics will stimulate industry growth. 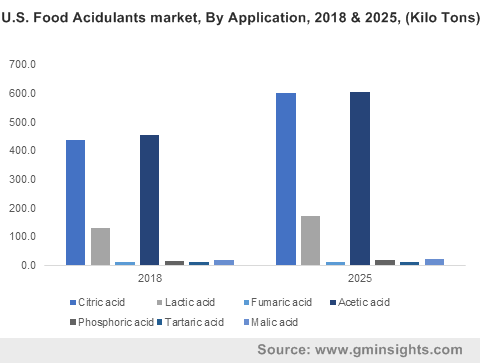 Rising demand for Acidulants owing to functional attributes including flavour enhancing, pH control, preservation, chelant and anti-microbial should foster acidity regulators market growth in projected timeframe. Food Acidulants market size from sauces & dressing application may anticipated to exceed 300 kilo tons by 2025. Extensive usage of acid regulator including lactic and phosphoric acid in sauces & dressings to restrict growth of spoilage organisms and retardation of enzymes activity involved in discoloration of fruits should stimulate acid regulator industry growth. Asia Pacific led by India, South Korea, Japan and China market may witness substantial increase which may account for over 4.5% by 2025. Growing demand for canned products & beverages has led to rising adoption of Acidulants during eatables manufacturing mainly for preservation. Increasing Chinese Acidulants production have imposed pressure on western players due to lower manufacturing cost which should foster acidity regulators regional market growth. Europe driven by Italy, France, Germany and UK food Acidulants market is estimated to surpass USD 2 billion by 2025. Significant rise in organised retail sector in UK has increased demand for packaged and ready to eat consumables will favour regional industry growth. Growth in consumer consciousness regarding clean labelled products will stimulate regional product demand. Brazil market may witness growth in the forecasted timeframe owing to growing exports of nutritional products. Brazil is world’s largest exporters of nutrition products including coffee, soybean and beef. In addition, presence of giant meat processing companies including JBS and BRF will have positive impact in product demand. Acidity regulators improve process efficiency along with stabilizing quality of fermented meat which will favour industry growth in processed meat applications. Companies are engaged into technical advancements including acids encapsulation to facilitate controlled release and enhance stability under specific temperatures will foster industry growth. Manufacturers are partnering with different research institutes to develop new products to cater rising global demand. 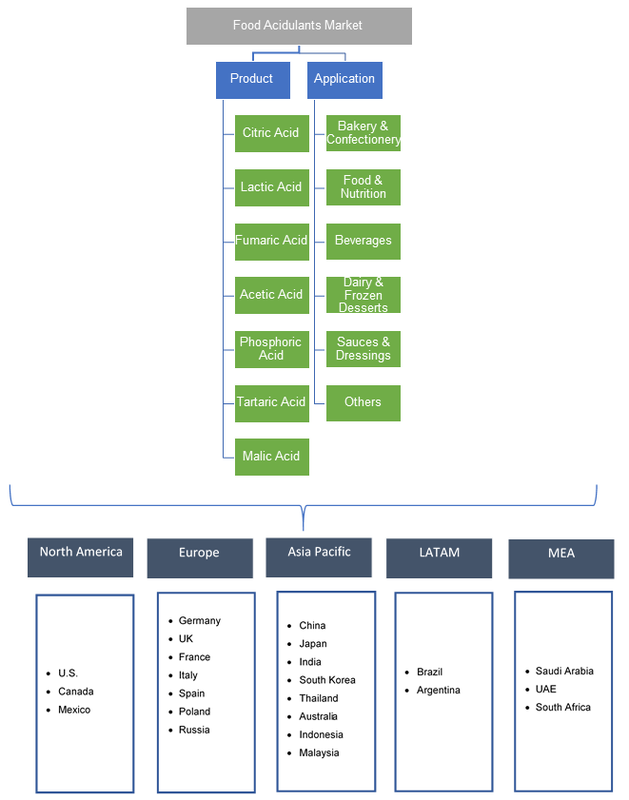 In February 2019, Bartek Ingredients Inc., the world’s largest producer of malic acid and food-grade fumaric acid, successfully completed capacity expansion by increasing production of malic and fumaric acid by 4,000 ton/year. This expansion would help in addressing growing demand of acid regulators worldwide. Food acidulants are substances which give products its desired characteristics such as tart, sour, or acidic flavour. These acidulants can be extracted naturally and produced commercially. These acids are majorly utilised due to beneficial attributes including flavouring agents, preservatives in microbial control, chelating agents, buffers, gelling and coagulating agents. Growing inclusion of Acidulants in packaged eatables to minimize spoilage and wastage cost, thus stimulating industry growth.